How to Play Sony Handycam 3D MTS on 3D TV with 3D Effect? » AIC Converter-Import AVCHD/MTS to FCP/FCE/iMovie How to import MTS files to iMovie on Mac Mountain Lion/Mac OS X Lion etc.? How to Log and Transfer MTS to Final Cur Pro (X)? How to edit MTS footage in iMovie? How to import AVCHD files to Final Cut? How to Convert AVCHD/MTS to PorRes? How to encode AVCHD MTS to AIC .mov? « Surprise for MTS to QuickTime or DV Format on Mac Yosemite! This article walks you through the whole process of converting 3D MTS footages to MOV Side-by-Side 3D Video with best 3D effects on 3D TV on Mac. Don’t forget your 3D glasses. 3D is a fantastic technology that was once only reserved for ultra exclusive film studios. Now, many users can purchase stereoscopic 3D cameras like Sony Handycam 3D at decent prices. However, it receives cheers and boos. The only problem is that many users are facing the problem while playing Sony Handycam 3D MTS on 3D TV. What’s the reason and is there any way to view 3D MTS videos from Sony Handycam on a 3D TV with ease? Tips: More hot topics about the complete workflow to transcode, edit, play, burn and share your Sony camera footage. With all of the surrounding of 3D technology and production in the last few years, more and more TVs can support stereoscopic 3D. Samsung 3D Smart TV, Sony 3D LED TV, LG 3D TV and so on are impossible to play Sony Handycam 3D MTS files directly because of the format limitation. The most effective way to transcode and play 3D MTS footages on 3D TV, a 3D MTS converter is a must. 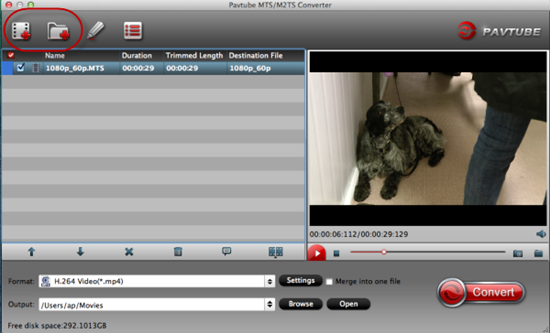 Here I highly recommend Pavtube 3D MTS/M2TS Converter for Mac I have used. It works perfectly for converting 3D MTS files to a proper format for easy playback on 3D TV keeping original 3D effects. Sony 3D MTS/M2TS converter is reasonably priced and easy to use. The other similar products may convert the audio a few frames behind the video no matter what settings you use, but this Sony 3D MTS converter works excellent and converts seamlessly. How to convert 3D MTS to SBS 3D MOV/MKV/MP4/AVI for smooth playback on 3D TV with 3D effects? Step 1: Backup your 3D MTS video from your camcorder to hard drive. Install and launch 3D MTS/M2TS Converter for Mac. Drag and drop 3D MTS files to the software. You can import multiple files at once thanks to batch conversion. Step 2: Set 3D TV friendly format. Click the drop-down list in the format line to get the format box. 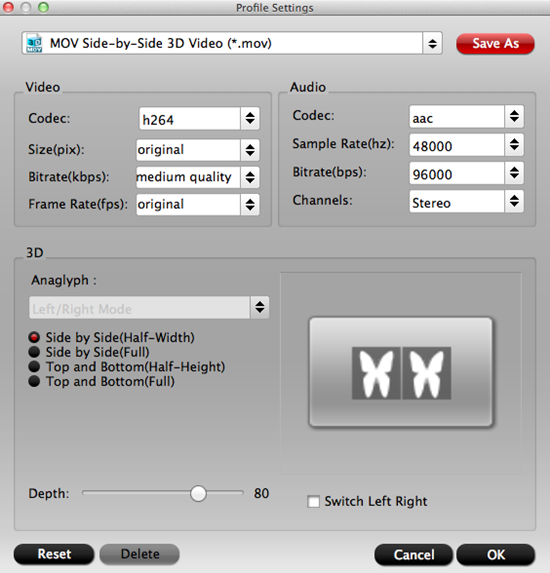 Then choose “3D Video>>MOV Side-by-Side 3D Video (*.mov)” as output format. Tips: Generally, MOV is a well-accepted file format for its ability to save memory storage and keep up the video quality. Of course, 3D Video in .mp4 and 3D Video in .mkv and 3D Video in .avi are all supported as well. Step 3: If you like, you could adjust video codec, bitrate, frame rate and so on to get better video quality in saved 3D MOV video. Meanwhile, you could choose 3D anaglyph and Depth in Profile Settings to avoid images misaligned. It’s optional. Step 4: You can preview to check the final result. Once you are satisfied with it, click the “Convert” button to start converting Sony Handycam 3D MTS video files to MOV Side-by-Side 3D Video format. It will take you a little while. Conclusion: After conversion, you’ll get no troubles in watching Sony 3D MTS videos on 3D TV with wonderful 3D effect! Follow the steps and have a try! 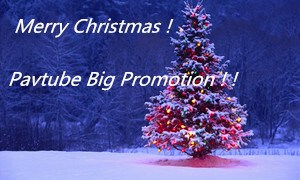 Best wishes for you to have a nice day! 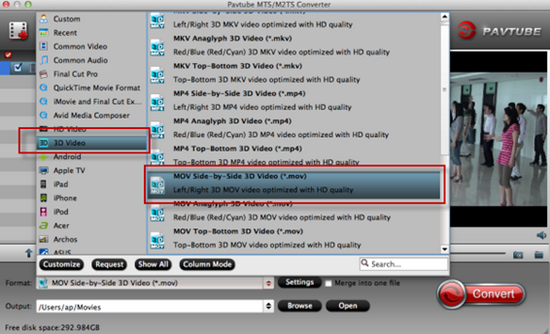 Get Trouble in Editing Canon 3D MTS Videos in iMovie?